Required on all units for California, Connecticut, Maine, Massachusetts, Maryland, New Jersey, New York, Oregon, Pennsylvania, Rhode Island, Vermont and Washington registration. Optional for Cross Border States. Cross-Border States are Arizona, Delaware, Idaho, Nevada, New Hampshire, New Mexico, Ohio, Utah, Virginia and West Virginia. Only available with 2.5L engine. Control code for units either shipped to California Emissions States dealers or ordered by California Emissions States dealers for registration in non-California States locations. In Maine, Rhode Island and Vermont, dealers cannot order vehicles for customers in non-California Emissions State locations (except Public Service/Emergency Vehicles - 936). 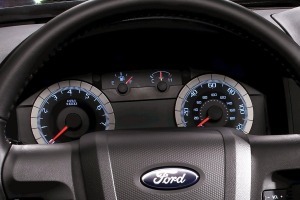 Ford SYNC voice activated communications and entertainment system that allows seamless integration of mobile phones and handheld media players via Bluetooth technology and USB connectivity. Additional complimentary features are Traffic, Directions and Information (TDI) which offers real-time traffic reports with text-message traffic alerts, GPS based turn-by-turn driving directions and the ability to search for information such as local businesses, news, sports and weather, 911 Assist, which in the event of an airbag-deploying accident automatically places a call to a 911 emergency operator and the Vehicle Health Report which allows customers to stay connected to their vehicle's condition and maintenance schedule. The Traffic, Directions and Information (TDI), 911 Assist and Vehicle Health Report features all require a Bluetooth enabled phone to be properly paired with the SYNC system in order to operate. (Traffic Directions and Information (TDI) services include a 3 year subscription and are subject to late availability. When paired with the optional Voice-Activated Navigation System (58N), SYNC Traffic, Directions and Information (TDI) services are replaced by the vehicle's Navigation System and SIRIUS Travel Link functionality). 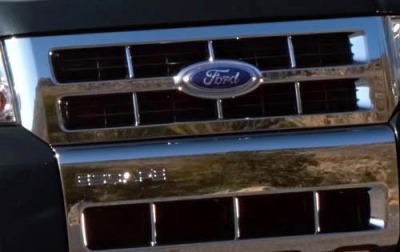 Vehicle with standard equipment; Sun & SYNC Package: Auto-dimming electrochromic rearview mirror with microphone, one-touch power moonroof with shade, mini overhead console with single storage bin and map lights and Ford SYNC voice activated communications and entertainment system that allows seamless integration of mobile phones and handheld media players via Bluetooth technology and USB connectivity. Additional complimentary features are Traffic, Directions and Information (TDI) which offers real-time traffic reports with text-message traffic alerts, GPS based turn-by-turn driving directions and the ability to search for information such as local businesses, news, sports and weather, 911 Assist, which in the event of an airbag-deploying accident automatically places a call to a 911 emergency operator and the Vehicle Health Report which allows customers to stay connected to their vehicle's condition and maintenance schedule. The Traffic, Directions and Information (TDI), 911 Assist and Vehicle Health Report features all require a Bluetooth enabled phone to be properly paired with the SYNC system in order to operate. (Traffic Directions and Information (TDI) services include a 3 year subscription and are subject to late availability. When paired with the optional Voice-Activated Navigation System (58N), SYNC Traffic, Directions and Information (TDI) services are replaced by the vehicle's Navigation System and SIRIUS Travel Link functionality). Vehicle with standard equipment; Cargo Package: Retractable cargo area cover, roof rails with cross bars and a wet trunk bin; Sun & SYNC Package: Auto-dimming electrochromic rearview mirror with microphone, one-touch power moonroof with shade, mini overhead console with single storage bin and map lights and Ford SYNC voice activated communications and entertainment system that allows seamless integration of mobile phones and handheld media players via Bluetooth technology and USB connectivity. Additional complimentary features are Traffic, Directions and Information (TDI) which offers real-time traffic reports with text-message traffic alerts, GPS based turn-by-turn driving directions and the ability to search for information such as local businesses, news, sports and weather, 911 Assist, which in the event of an airbag-deploying accident automatically places a call to a 911 emergency operator and the Vehicle Health Report which allows customers to stay connected to their vehicle's condition and maintenance schedule. The Traffic, Directions and Information (TDI), 911 Assist and Vehicle Health Report features all require a Bluetooth enabled phone to be properly paired with the SYNC system in order to operate. (Traffic Directions and Information (TDI) services include a 3 year subscription and are subject to late availability. When paired with the optional Voice-Activated Navigation System (58N), SYNC Traffic, Directions and Information (TDI) services are replaced by the vehicle's Navigation System and SIRIUS Travel Link functionality). Vehicle with standard equipment; Cargo Package: Retractable cargo area cover, roof rails with cross bars and a wet trunk bin, Leather Package which consists of ambient lighting, leather-trimmed seats, and heated front seats; Sun & SYNC Package: Auto-dimming electrochromic rearview mirror with microphone, one-touch power moonroof with shade, mini overhead console with single storage bin and map lights and Ford SYNC voice activated communications and entertainment system that allows seamless integration of mobile phones and handheld media players via Bluetooth technology and USB connectivity. Additional complimentary features are Traffic, Directions and Information (TDI) which offers real-time traffic reports with text-message traffic alerts, GPS based turn-by-turn driving directions and the ability to search for information such as local businesses, news, sports and weather, 911 Assist, which in the event of an airbag-deploying accident automatically places a call to a 911 emergency operator and the Vehicle Health Report which allows customers to stay connected to their vehicle's condition and maintenance schedule. The Traffic, Directions and Information (TDI), 911 Assist and Vehicle Health Report features all require a Bluetooth enabled phone to be properly paired with the SYNC system in order to operate. (Traffic Directions and Information (TDI) services include a 3 year subscription and are subject to late availability. When paired with the optional Voice-Activated Navigation System (58N), SYNC Traffic, Directions and Information (TDI) services are replaced by the vehicle's Navigation System and SIRIUS Travel Link functionality).